This simple humidity sensor circuit, shows us the humidity level that land under test has. To achieve the goal, a couple of probes are used. These probes are placed as shown on the diagram, with their ends buried in the ground to be tested. When the ground is wet, LEDs lights up alternatively and the frequency depends on the humidity level of the soil. How the humidity sensor circuit works? 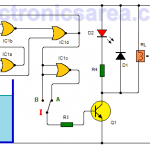 This humidity sensor circuit uses the 555 integrated circuit (timer). The 555 is configured as astable multivibrator and for the circuit to oscillate, a capacitor (C1) and two resistors are needed. 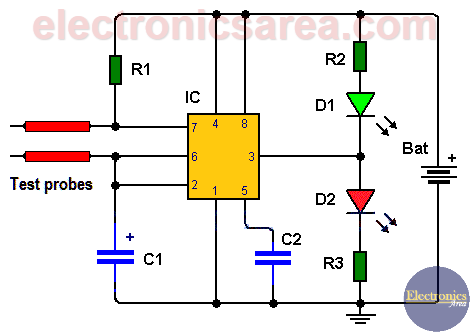 R1 resistor: located between the 555 pin 7 and the positive terminal of the battery as shown in the diagram. 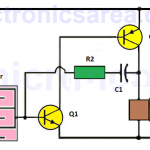 R4 resistor: This is nost a real resistor and it is not shown in the diagram, but in this case is replaced by the resistance of the ground under test. (resistance obtained using the probes). Depending on the moisture of the ground, its resistance (R4) will vary, and hence the oscillation frequency of the 555 timer. This frequency is displayed on LEDs (D1, D2). LEDs can be the same color, but in this case we use one green LED and one red LED to achieve a more noticeable display. This circuit becomes portable, if you use a 9-volt battery. In the diagram of humidity sensor, R2 is clearly shown whereas it is mentioned that R2 is not shown! . Please clarify this. I already made the corrections to the article, I hope it is understood well now, R4 is the resistance of the ground under test.